Eden Hazard struck in either half, while Willian and wing-back Victor Moses also struck as Antonio Conte's team ran out comfortable victors in the end. However Italian Ezequiel Schelotto - played as a wing-back in a changed 5-3-2 formation - went down under challenges from goalkeeper Willy Caballero and midfielder Tiemoue Bakayoko in the area in the opening 45 minutes. On both occasions referee Jon Moss waved away appeals - booking Schelotto for his protests after the clash with Bakayoko - but Hughton felt different decision should have been reached for both. He said: "I felt they were both penalties. I'm probably more disappointed with the first one because there was an incident waiting to happen. When the goalkeeper (Willy Caballero) comes out there is always going to be a decision made and when you have a referee on the pitch, and even more so the linesman probably 20 yards away, it is disappointing. If that then goes in, we have a scoreline of 2-1 and it just gives you that little bit of momentum. It was hugely disappointing, with the chances we had and penalty appeals the scoreline was not a fair reflection." Chelsea were without a win in 90 minutes in any of their previous five matches coming the the Amex but made a blistering start. Hazard and Willian both struck inside six minutes to put their team in command. Hughton added: "We started poorly and they started well. If I analyse the goals, their second shows what they have in terms of quality and the fact that they are Premier League champions. I felt the first, third and fourth goals we could have done better. I think the third and fourth goals were more about us still being in the game and trying to get back in it. They caught us in those moments, which against teams like them can happen." 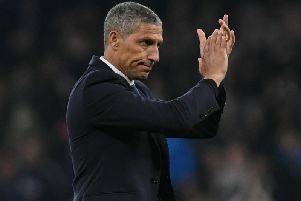 Reports on social media prior to kick-off suggested Anthony Knockaert left the stadium after discovering his omission from the matchday squad, though, Brighton boss Hughton revealed the French winger watched the match. He said: "I saw Anthony (Knockaert) just before the game, so I know he was here. I do know I saw him before the game and I know he was here for the game."